Experimenting with soap is not something many people think about often. However, many things made from soap can be a lot of fun. If you want something fun for kids at bath time, then making soap clouds will be a fun, kid-friendly activity. The most important aspect of soap clouds is making sure to use Ivory soap. If you use another soap for this project, then the results will be disappointing. You can find Ivory soap at most grocery stores or stores that sell health and beauty products. What’s nice about this project is that making soap clouds is not wasteful as you will still end up with useful soap. You will be making soap clouds by using a standard microwave. Make sure to place the bar of soap on parchment paper, wax paper, or paper towel. This will allow you to ensure that the soap is easy for you to remove from the microwave. Unfortunately, no other method seems to be more effective at making the soap clouds than using a microwave. However, the clouds that you make will be an impressive creation. 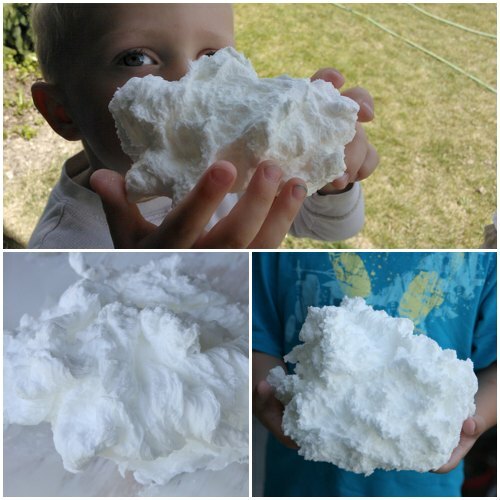 Kids who are interested in science will enjoy making soap clouds. The most interesting thing about this activity is how the soap expands when exposed to the heat inside a microwave. If you want to see impressive results, then make sure to use a fresh bar of soap. The best thing about creating clouds from soap is that every result will be different. Completed soap clouds may look wet when complete. This is not really the case as the clouds are light and brittle. If you drop the soap on the ground, it will likely break into hundreds of pieces. However, this will be an ideal excuse to grab another bar of soap and make another cloud.